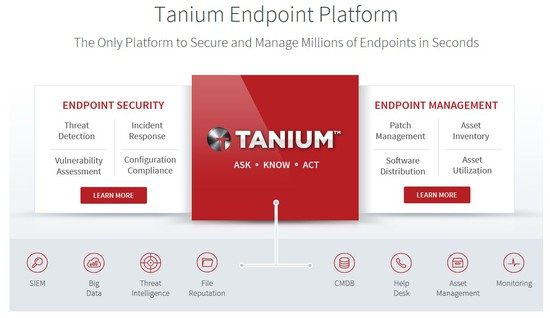 The Tanium Endpoint Platform is the first enterprise platform that provides security and IT operations teams with 15-second visibility and control to secure and manage every endpoint on the network, regardless of the size. At the heart of this platform is Tanium’s patented linear-chaining architecture. Tanium transcends the inherent limitations of hub-and-spoke architectures by decentralizing management intelligence directly onto individual endpoints through a single, lightweight agent. Each managed endpoint maintains an awareness of nearby machines on the network by contacting the Tanium Server periodically to get a concise update on the current state of its neighbors. This simple interaction automatically pairs each endpoint with the optimal client to receive information from and a different one to pass information to, thereby deliberately forming a series of efficiently chained endpoints. To propagate queries or actions to every endpoint throughout the entire network, the server simply sends information to a small set of endpoints along these linear chains, and collects aggregated results back from the endpoints at the end of these chains. This innovative approach fundamentally resolves the most egregious shortcomings of hub-and-spoke architectures, and is the foundation for the Tanium Endpoint Platform’s unparalleled speed and scalability. Detect security incidents at an early stage and react accordingly. InfoGuard offers you Tanium exclusively as a service - starting at 300 endpoints already! Long-term cooperation with Tanium as certified Swiss Partner. InfoGuard has a engineering team of certified Tanium specialists. For our comprehensive SOC and NOC services, we rely on the solution of Tanium.